Love the lace skirt! It’s so flowy and pretty, really quite enchanting. This place looks beautiful, too. Reminds me of Rihanna’s “Only Girl In The World” video clip. what a beautiful outfit! Love the skirt! I love that skirt to death! Nice skirt, you can do so many things with it. yay! what a beautiful smile! So in love with your Topshop Cardigan! love the shapes of that outfit! You look quite light with this look of today. I simply love how white and pink fits SO WELL in you! You and All Your Readers! You look just like a fairytale! Love those pics!!! Gorgeous layering! I love your blog, thank you for your daily posts ! you look too cute! and i am simply in love with your skirt – fabulous! That lace skirt is just so wonderful! These shots are amazing!! and you look fabulous. You have a beautiful smile. 🙂 Happy Monday dear. Absolutely beautiful, such a unique take on layering-you always get it just right! Love this post. So much fun. Your skirt is so gorgeous! I really love seeing how everyone is bringing maxi skirts into winter. i am in love with your cardigan. topshop always has beautiful printed stuff! This ensembles is very quirky and dreamy at the same time. your look is always fabulous!!! these pics are wonderful, great location! Very cute and so romantic! The skirt is wonderful but aren’t you always in a lovely field recently? What’s up with that? Such a pretty outfit! Love your pictures as always! I’ve been looking for the perfect maxi skirt for summer, and the search has been pretty fruitless so far. The skirt it so lovely… it sort of reminds me of snow. Awesomest posts is written by you, like the way of your writing. Our online shopping destination allows you to find fabulous festive sale online, Women Fashion Clothing, Baby Baniya’s new collection of bags and Jewellery, Autumn/Winter fashion show in Delhi India. Thanks for your informative post we will be following your blog more closely in future. so rad!! looove the scenery! If anything makes the difference is in how well it blends materials and prints. I like your white flowers. I love the combination of sheer dress and warm gloves and sweater. 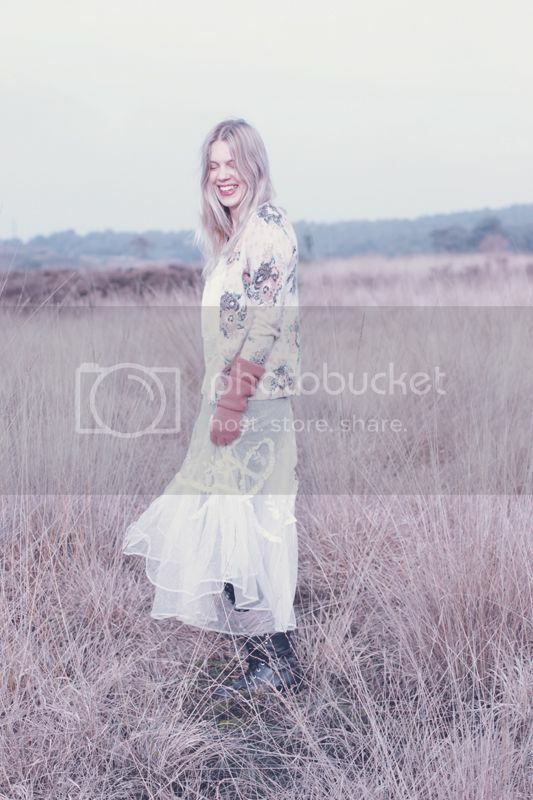 I wish this outfit was mine, and I could be in that lovely field.